Checkout the virtual boats that get projected on the wall at the RRL! Today’s focus is Rowing Power, so be sure to get in a good warmup and go hard for the 10 x :30 On/ :30 Off. During the On strokes keep the rating under 36s/m and fight to remain smooth and clean as you get after it. During the Off strokes paddle lightly at a 16-18 stroke rating while focusing on breathing and bringing your heart rate down. Build the pressure up with about 3 seconds remaining in the rest. 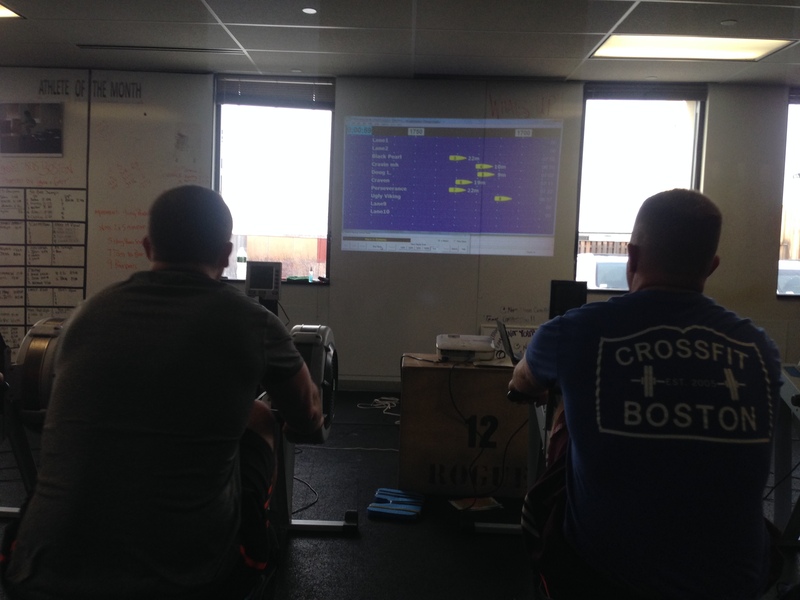 The Renegade Rowing Training Plan uses a block system to vary training focus, stimulus, volume, and intensity. A block is a workout. Each block can be classified by type and length. Rowing blocks will be short, medium, or long. Fitness blocks will be short, medium, or long. Strength blocks differ slightly from the others in that they will not have a designated length, but rather a designated focus of total, lower, upper body, supplemental, or core strength. Depending on the focus of the training cycle, the week, and the day the programming will use specific blocks to fulfill our needs. The Renegade Rowing Training Plan can be tailored for you, your schedule, and your ability by adding or subtracting blocks based on what you need work on or what you have time for. If you need to build endurance be sure to add additional rowing blocks each day that focus on building aerobic capacity like the Pyramid and Castle workout from yesterday. If you only have a half hour to fit something in then hit the focus for the day, which is posted in the title of the blog. Today’s focus is the Rowing Block. If you only have time to fit in two blocks, then hit the focus for the day and either the strength or conditioning blocks based on what you need to improve. Have fun and post your results and experiences to comments! This entry was posted in Rowing and tagged endurance sports, exercise, functional movements, personal experiences, recruitment patterns, rowing, sports, training by Renegade Rowing. Bookmark the permalink. Awesome work Terese! Nice Power! Solid work Larry! I’m going to attack this in an hour or so. These were tough but fun! Only had time to fit in the row and the hollow rocks, but looking forward to the bear complex and burpees in addition to tomorrow.